The first of the month is always stressful if you have bills to pay. Miss your monthly deadlines and you’re suddenly without cable, Netflix (not that it’ll matter because you didn’t pay for internet either), a phone, and a gym membership, among other things. Mobilligy Bill Pay wants to save you from this and all those annoying bill collection calls by giving you financial control on your phone. It’s out on most platforms, but launches on Android today. In honor of the launch, we finally sat down and tried appifying our bill paying. To start, you enter in all of the regular bills that usually flood your mailbox into Mobilligy. It’s job is to help you avoid late and overdraft fees by reminding you when bills are due. If a reminder isn’t enough, you can also pay bills directly from the app, provided you’re willing to share all the details required to do so. We set up the app, which asks for information about your most common bills: Internet, phone, utilities, credit cards, and auto loans. 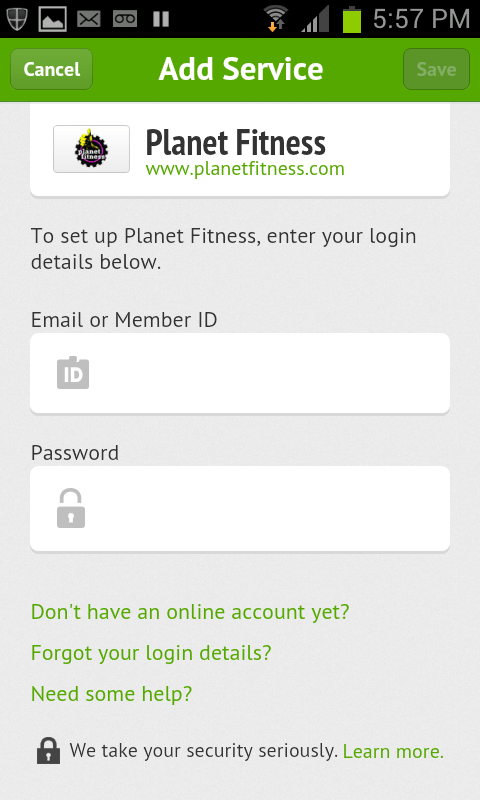 Select your particular provider for any of these from the extremely long list and enter your login information. 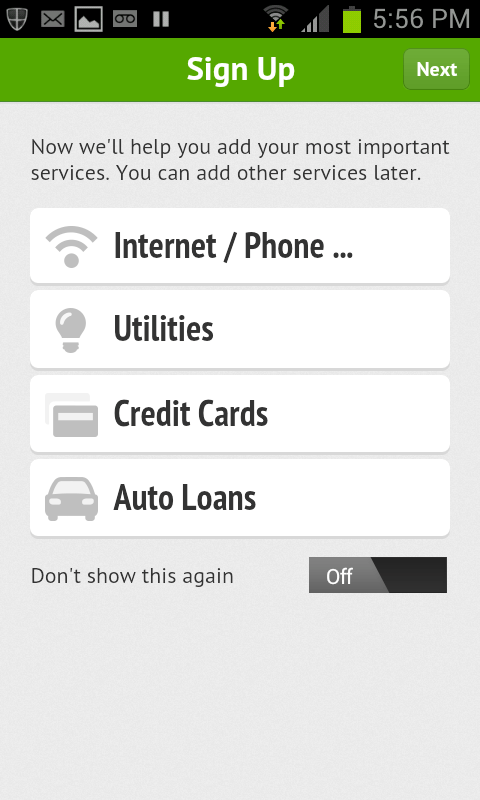 (If a service you use isn’t available, you can alert Mobilligy and request it be added.) The same process is required for anything beyond the basics, which will be defined by your lifestyle. Gym memberships, home security services, media subscriptions, insurance coverage, mortgages, student loans – you name it and it can be added to your queue of dues owed. We always hesitate when an app asks for the details of our accounts, but Mobilligy promises bank-level encryption for all of the information you store in it. And the ease of use that comes with a linked account simplifies things considerably. Once you’re logged in to a service on Mobilligy, you can pay bills from the app rather logging into separate apps or websites. To complete payment from within the app, you’ll also have to authorize a bank account or credit card, another layer of required trust added to the burden of using Mobilligy. The unofficial title of this app may as well be “Mobilligy: Or How I Learned to Stop Worrying and Love the Convenience.” What it offers is a wonderful service, and there’s no indication that it’s anything less than secure. But like other awesome banking apps like Mint, you’ll get nervous each time you feed it a new password. Manilla also wants to pay your bills. In testing, we found that Mobilligy has considerably more options for accounts that can be linked to it. Our credit union, Web host, and gym aren’t on Manilla but Mobilligy has them. 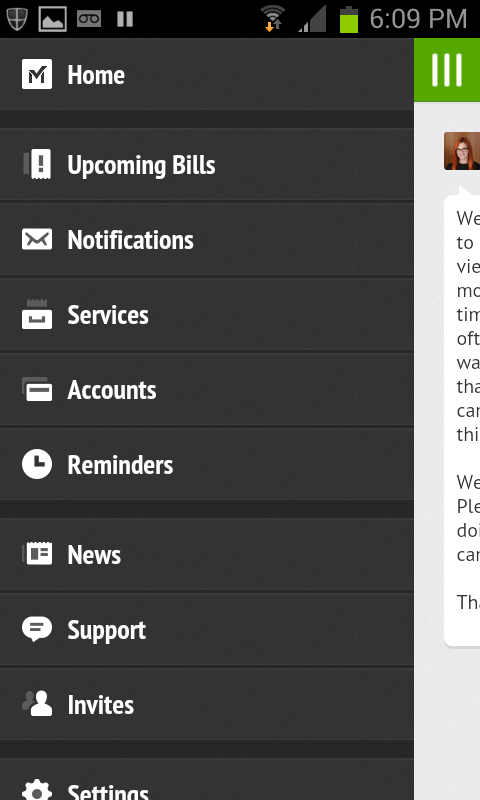 You also can’t pay your bills using Manilla – something you can do with Mobilligy. Manilla does store a copy of bills and statements as PDFs though, which is a nice feature that Mobilligy doesn’t offer. Mint is a good compliment to Mobilligy. It’s more focused on helping you manage your entire budget, which Mobilligy doesn’t really do. Mobilligy just deals with your bills. 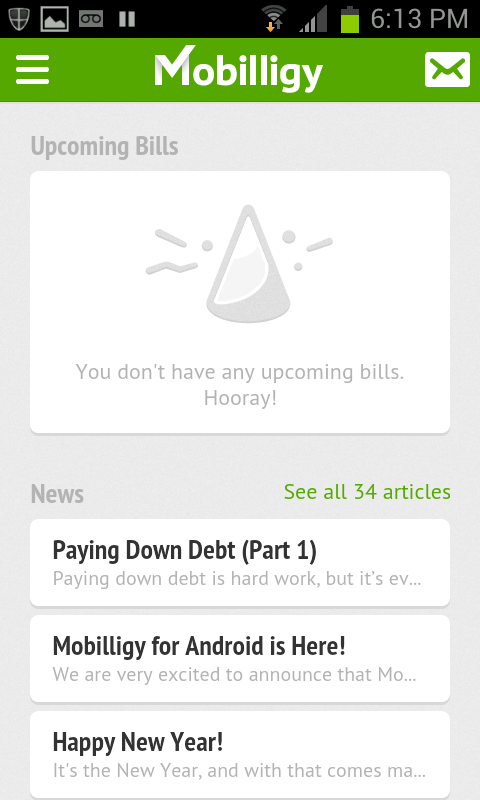 Mint offers reminders for upcoming bills, but it’s pretty bare bones compared to Mobilligy. The nice part of Mobilligy is it’s far more alert than you. If you’re especially forgetful, the regular notifications that the app offers will save you hassle and late fees down the road. You’re notified the second a bill arrives and told when its due date nears. Since the app is linked to your bank accounts and credit card information, it can show you how much money you owe right next to how much you have on hand, so you aren’t flying blind while you pay the bills. Overall, for those with a lot on their plate when it comes to bills to pay, Mobilligy Bill Pay can be a powerful tool. The free app can probably save you money in the long run if you’re susceptible to accidentally missing a bill now and then. If you can muster the courage to trust the app with your information, you’ll be rewarded with one of the best financial helpers we’ve used. Mobilligy Bill Pay just launched on Android today, but is also available for free on iOS, Windows 8, and Windows Phone.